Yesterday was Remembrance Sunday and the beautiful and moving art installation at Tower Bridge has captured the hearts and imaginations of the British public. 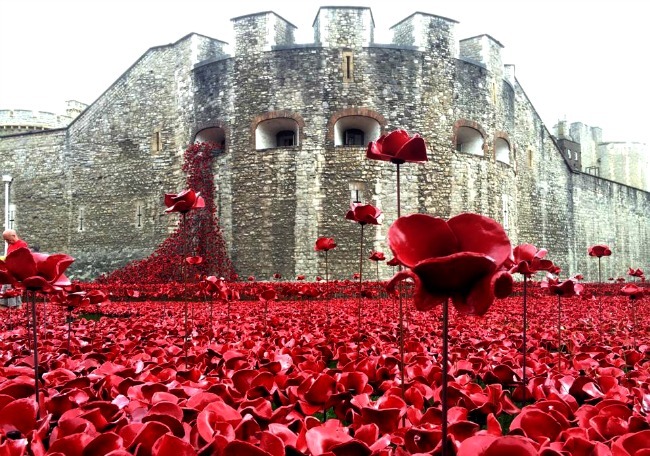 Our colleague Gemma was a volunteer poppy planter, read on to find out what it was like. “Our poppy planting shift started at 1pm, when we reported to the volunteers office and were issued with a t-shirt, gloves and protective eye wear. After being introduced to our team leader, we watched an introductory video. This showed us how the poppies were made and how we had to put them together for planting. On the day, we were taken to the most significant area (where the poppies spill out from the tower above us). It was a very surreal experience – at the time, visitors to the Tower were increasing. We had a big audience with people taking pictures of us and some shouting down questions. There were a huge range of volunteers – from retired couples and single adults to groups of school children and scout groups. Everyone taking part was so happy and honoured to be part of this amazing experience.